Rotor: Rotor is the key working parts of impact crusher, which must have enough weight to crush lump ore. Therefore, the rotor of large-scale impact crusher generally is integral cast steel structure. This kind of integral rotor is bigger, more durable and suitable for strike plate installation. Another laminated rotor is made of several pieces of cast steel or steel plate. This kind of laminated rotor is easy for manufacture, easy to keep balance. 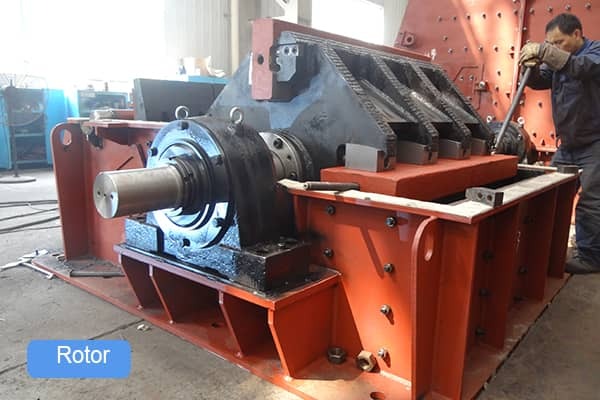 The motor of small crusher is made of cast iron or steel plate welded on sleeve rotor, but its structure strength and stability is not good enough. Plate hammer: Plate hammer is also called strike plate, which is the easiest wear part of impact crusher. Its wear situation is more serious than that of other crushers. 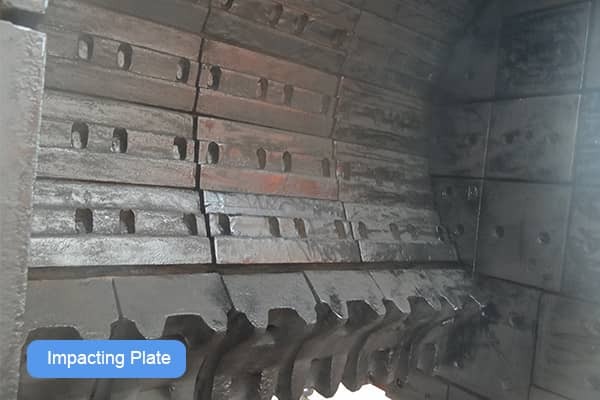 Wear degree and service life of plate hammer are related with many factors such as the material, linear velocity (the rotor circular velocity) and the structure of impact plate as well as ore hardness. In which, hammer material is the key factor to determine the wear degree. Impacting plate: Impacting plate structural form has a great influence on its crushing efficiency. Impact plate has several form structures, folded and circular-arc, etc. Folded structure is simple, but it is not the most effective impact grinding method for ores. Circular-arc structure, more commonly used in involute curve, the characteristics of this kind of structure is impacted on each point of plate in vertical direction by ores, therefore its crushing efficiency is high. Impact plate also can be made in the form of grizzly bars or rollers. This structure is mainly used to screen ores, improve the production capacity of crusher, reduce over grind, and reduce power consumption. Luoyang Dahua has various types of impact crusher, PFQ strong impact crusher, ISP fine impact crusher, BP impact crusher, PFY hard rock impact crusher, and PLS vertical impact crusher. The machine is widely applied in the fields of cement, construction, chemistry, highway and railway, etc. For more information, please contact lydhchina@huazn.com or Skype: Crusher Dahua. Previous Article：How to Remove the Dust from the Jaw Crusher?